Imagine that you have been asked to introduce someone to a group of your coworkers. He has been retained to help your work team build improved work habits to increase efficiency and productivity. The person you’ve been asked to introduce is a true expert in his field, yet you know that some will be skeptical. They’re not sure who this person is, or why he’s here. They don’t feel the need for expert counsel or advice; they know their jobs. In fact, many will feel threatened by his presence as they wonder, “What does he have to do with me?” In introducing this person, you want to immediately establish his credentials; you want your group to realize quickly that this person is one to whom they should listen. The opening sentences of John’s Gospel provide such an introduction. My analogy is a bit flawed, for John isn’t just introducing an expert on life; John is introducing the Creator and Savior of the world. In these five sentences John tells us everything we need to know about the credentials of this Jesus of whom he writes. Indeed, these five verses of Scripture present a simultaneously succinct and thorough introduction of our Lord and Savior, Jesus Christ. Many tend to perceive Jesus as the middle of the story of man. We mark history according to His birth (Before Christ; Anno Domini). Some shy away from the Old Testament and its books of history, poetry, and prophecy incorrectly presuming that it has nothing to do with Christ; after all, He is not formally introduced until the Gospels, right? Some view Jesus as God’s “Plan B” with the Old Testament describing God’s failed “Plan A”. It is this flawed human logic that leads some skeptics to ask why I place my faith and trust in this Jesus. It is this flawed human logic that leads many believers in Christ to the conclusion that God’s Word is subject to amendment at man’s will and whimsy. Jesus is eternal. He didn’t ride in on his heavenly white horse to solve an unforeseen problem; His act of redemption was planned from the beginning of eternity. When does eternity begin? It doesn’t – see what I mean? Jesus has been here all along. Jesus is God. That’s the only way He can be eternal, after all. As God, Jesus has all power, authority, and dominion. What He says goes. What He wills happens. Jesus created all things. Hence His eternal existence. Jesus is the Author of Creation. Nothing exists that He didn’t will to exist. It’s that simple. Jesus is the source of life itself. Science cannot explain the genesis of life. Here, John is introducing Life Himself. As Jesus authored creation, He breathed life into all living things, including man. Jesus lights the only way to life as He, life’s source and creator, intended it to be. On his own, man wallows in the dark depths of sin. By grace, Jesus came that we might have life as He intended it to be. His Light pierces the darkness of sin, and sin cannot overcome His Light. Jesus, The Word, is the only source for knowing how to live life on earth as well as what we believers can look forward to for eternity. I take great comfort in the reality of my Savior. Man’s theories are full of holes. They’re based on supposition and hypothesis. But, ultimately, whether you believe in the True God of the Bible or whether you place your trust in something or someone else, it ultimately boils down to faith, does it not? Either you place your trust in God’s Word or you place your trust in man’s conjecture. Friends, there is much, much more to life and our existence than any man can possibly fathom. Knowledge of that Truth begins right here with these opening verses of John’s Gospel. As I embark on my Journey through the Gospel of John, I’m looking forward to broadening my relationship with the Savior of the World – my Savior and yours, Jesus Christ. As I journey through this great account of Jesus, I will be sharing my thoughts and insights right here on my blog. I hope you’ll join me. My Prayer for Today: Heavenly Father, Thank you for revealing Your Truth through Your Holy Word. As I embark on this study of the Gospel of John I pray that You would open my ears and my heart as you give me the gift of discernment. As I record my thoughts and insights, I pray that they would be helpful to any who might choose to join me in this study. In Jesus’ name I pray, AMEN. We are living in a very interesting point in history. This great American experiment called Democracy is, I believe, on the brink of failure. Sound cynical? Consider: We Americans seem completely willing to surrender our personal liberties to an uber-powerful government that is increasingly disconnected from the people it is supposed to serve. Our national debt is growing at an alarming pace as those in leadership do nothing to stop it. Our moral values as a nation are eroding away day after day. As I consider these things, I am reminded that I trust and serve the God of the universe. He who made all things is bigger than government, and His plan is perfect. 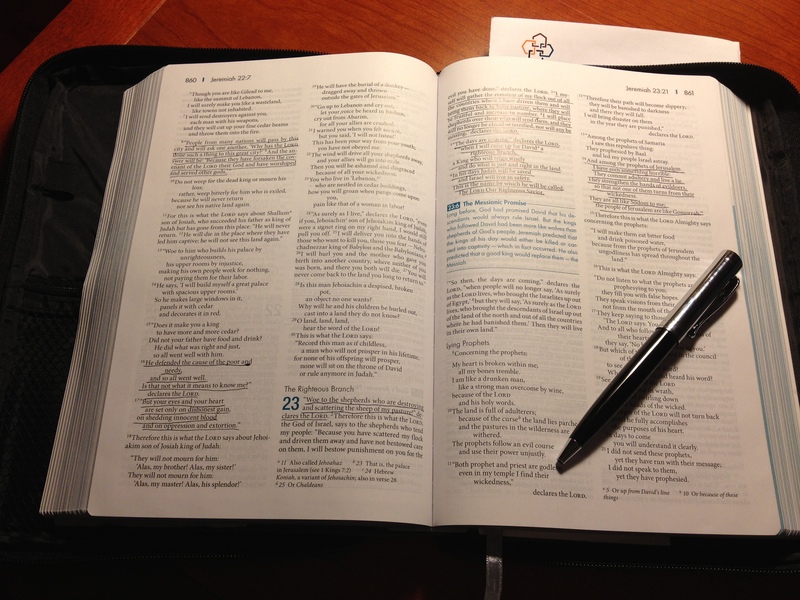 I’ve completed my study of the book of Jeremiah. God spoke through Jeremiah to a nation, much like the United States, that had abandoned His truth and His ways. Israel was serving false gods and seeking after worldly wisdom just like we are today. We can read the Bible and see the consequences of Israel’s sin; the future of the United States is yet to be written, although our omnipotent God already knows our fate as a nation. I am so thankful for the gift of faith. Through faith, I can see past the sin of this world into the eternity that awaits all believers in Christ; an eternity in the presence of Almighty God. I pray for a revival in our nation. I pray that we the people will look to God through study of His Word and through prayer for our nation’s well-being. I pray that God would open the hearts and the minds of the American people to His eternal truth. That eternal truth is available, right at our fingertips. And as American history unfolds before our eyes, we can seek wisdom and comfort in God’s book called the Bible. The Bible, from Genesis through Revelation, is all about Jesus. It reveals God’s plan of redemption for His creation. There is no book in the Bible that is not relevant to today. It is wholly and universally true. It is without error. The wisdom of the world wants us to view the Bible as a spiritual guidebook or, worse, a collection of human writings assembled by men in a conspiracy to mislead us. That is the world’s wisdom at work, and it is a dangerous supposition. The Bible is God’s revelation of Himself to us; it is what He wants us to know about Him. A life and a nation built on the foundation of human wisdom is doomed to failure. On the other hand, a life and a nation build on the foundation of God’s Word will be blessed. As a believer, I will engage in the political process. I will share God’s truth. I will align my political positions with God’s Word as He gives me the wisdom and ability to do so, and I will communicate my positions out of love and respect for my fellow man. I will not despair over the state of our nation, nor will I worry about the future. Through Christ, my future is sealed for eternity. That reality frees me to engage absent any fear for what may lie ahead. My prayer for today: Heavenly Father, as I consider the state of our nation I am tempted to worry. This morning I lift up all in positions of authority in our government. I pray that You would grant them wisdom and clarity of thought. I pray that You would compel them to seek Your will in all things. And, Father, I pray for a revival in this land; a revival that would reach from sea to shining sea, causing all of us to realize our sins, confess and repent, and trust completely in You through our Lord and Savior Jesus Christ. 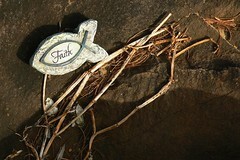 Help me to be a faithful witness to Your Truth according to Your will. In Jesus’ Name I pray, AMEN. As I observe the disfunction in Washington and the growing division within our nation, my concern for our country’s future continues to mount. My study of Jeremiah has offered reassurance, as I am reminded of God’s sovereignty; no matter what our government does or doesn’t do, God is ultimately in control. As the prophet Jeremiah records these words of God, much of Israel is in exile as punishment for their unfaithfulness to God. God hates sin, but His love for His people never wavers. At this writing, Israel’s time for restoration is approaching and the exiles will soon return home. Israel’s sweet reconciliation with God is soon to be at hand. It reminds me of the ultimate reconciliation. Sin effectively separates us from God and there is nothing we humans can to to change that. Separation from God yields a life filled with questions. “Why am I here? What’s the point? I’ve built wealth and accumulated things; why am I still not content? What is my destiny for eternity?” A life built on the things of this world is, indeed, an empty life. God is eternal and He created us to be eternal along with Him. Because God loves us so much, He sent His Son, Jesus Christ, to pay the ultimate price for our sins. Through His redemptive sacrifice, we are reconciled to God. Through faith in Jesus, we know that we will live eternally with Him. Once we know that reality, the answers to the remaining questions become crystal clear as we see our lives the way God intended us to see them as our journey in this world becomes aligned with the will of our Creator. We are free to follow our own wisdom if we choose. We can seek appeasement and self-worth; we can build wealth and accumulate things. We may even find some temporary relief in those things. God will allow that, but as we consider our eternal destiny – eternity in God’s presence versus eternity completely separated from Him – the ultimate choice must be made: Do we continue to seek after worldly things, or do we give ourselves and our lives to the One who made all things? Worldly things will fade, and if we cling to them we will someday find ourselves desperately trying to cling to nothing. Jesus said, “Heaven and earth will pass away, but My words will never pass away” (Mark 13:33). That is the foundation on which I choose to build my life! 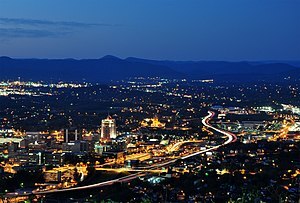 My favorite place I have lived is Roanoke, Virginia. I confess that I sometimes lament that I don’t live there now. Israel is exiled as punishment for disobeying God. But even through the course of punishment, God loves His people and promises to restore them when the time is right. Even through the course of punishment, God gives them the hope and reassurance that He has not abandoned them. I can’t help but think that God also wants the people of Babylon to see Him through the exiles. God’s Word is ultimately for the world, not just for Israel. Jesus came to save us all. 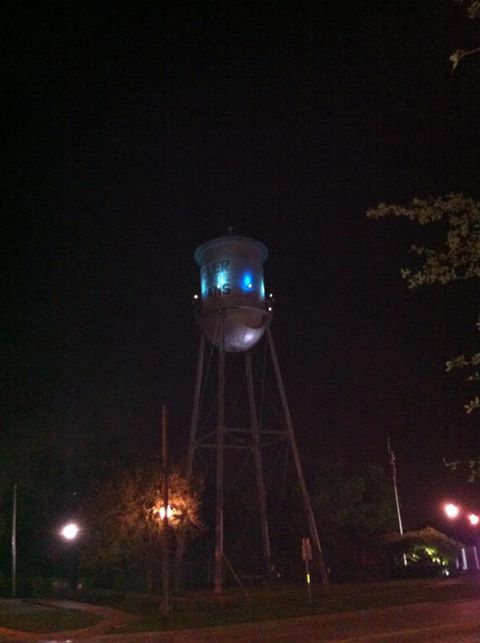 The Keller water tower bathed in blue lights after a Keller High School victory! In reading Jeremiah’s letter to the Israeli exiles in Babylon, I am convicted. No, I haven’t been exiled to Dallas/Fort Worth, but God has me here for a reason. He wants me to fully embrace this community, to pray for it, and contribute to its well-being. As I consider this passage, I am reminded of the times I have lamented having left Roanoke. I am reminded of the groaning and complaining I’ve offered concerning our search for a church home, the traffic, the pollution, the crowds and I realize I have missed the point. God wants me to be a part of this community; that’s why I’m here. What about you? Are you dissatisfied with your lot in life? Are you grumbling about your employer, your neighborhood, or your school? Does the grass look greener someplace else? If you answered “yes” to any of these questions, I encourage you to read this passage and then go to God in prayer. Ask Him what He wants you to do to contribute to the well-being of the community to which He has led you; the place in which you find yourself right now. Then go out and serve the Lord where He has planted you. My prayer for today: Dear Heavenly Father, as I look out my window I see my community differently after having read this passage. Thank You for Your Word, and thank You for calling me here. Show me, Lord, each and every day how I may serve You here. In Jesus’ name, AMEN. …Is this all there is? We all wonder sometimes how we impact our world. Is my impact helpful? Are people better off for having known me? Are my daily life, my priorities, my hopes, my dreams pleasing to God? Should I be doing something different, or should I be doing what I do in a different way? We tend to forget that we are where we are for a reason. We touch people in some way each and every day. As we ponder our future with it’s possibility for life changes, let us not forget about the people we impact today. Let’s celebrate those opportunities! 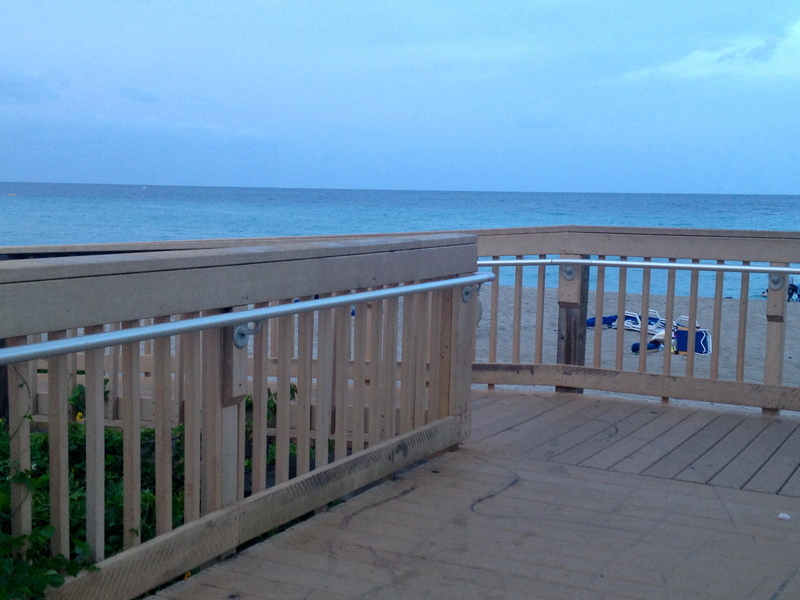 God has a plan, and that plan is coming to fruition, even as I write this post and you read it. Take me for example: I work in corporate America. I also enjoy writing my blog, even though I don’t write as regularly as I’d like. I enjoy public speaking. I think it would be cool to publish a book – a book that people would find helpful and inspirational in some way. Could I make a living doing these things? Should I even try, or is this the proverbial mid-life crisis finally knocking at my door? I stand firmly on that promise. At 51 I see lots of road in my rearview mirror and, God willing, I have much road yet to travel. No matter where we are in life, we all see that road, don’t we? Be open to change, but remember also that, right now, you are exactly where God wants you to be. Honor Him by making the most of today as you continue to explore the possibilities for future change. I see today’s opportunities with a fresh set of eyes. With that clear vision I will explore the pursuit of my dreams. God will show me which road to take. Where is He guiding you? This morning, as our pilot guided us into Chicago O’Hare International Airport on final approach, I looked out my window and saw two planes flying alongside us. 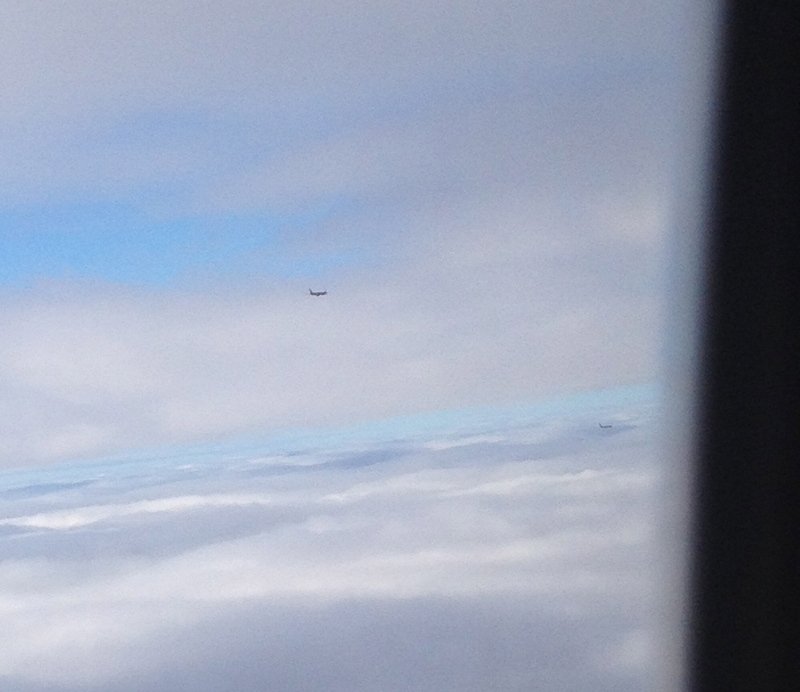 My immediate thought was humbling: Look how small these jumbo jets appear in the sky. Now I know what it feels like to be a grain of sand on a vast expanse of beach. As big and important as I may sometimes think I am, I’m really just a speck in the vast realm of human existence. Through this simple verse, God reminded me that, although I may be insignificant in the context of the world, I am not insignificant to the One who matters most. The reality of being loved by the Creator of all things, the One who saves me from my sins, is overwhelming. In that instant, God reframed my point of reference. He knows me more intimately than anyone, even myself. As we landed at O’Hare and approached our gate, I was reminded that God has joined me on this journey. He reframed my perspective on today. And for that I am so very thankful. Have you ever wondered what true contentment feels like? How do we find the proverbial calm in the midst of the storm? Does such calm even exist? Over the past week or so, I’ve been very agitated over events currently facing our country. In observing the behavior of our government officials, those whom we elected to office, my anger often supersedes the attitude and outlook that I, as a Christian, know I should have. My anger and frustration is fueled even more when I see how we Americans treat each other with disrespect, anger, and disdain that seems to draw, at times, dangerously close to downright hatred. I worry about the future of our country. I worry about the condition in which my generation is leaving our country for our children and grandchildren. Worry, worry, worry! Out of the genuine concern I feel for my country comes emotions and words that, at times, I wish had never manifested. Amidst my storm of worry, I open God’s Word. Therein resides the eternal calm in the midst of the temporal storm in which I find myself living day after day. Yes, our nation is in crisis; I truly believe that. But even in crisis, God reigns supreme. You see, my human frailty – the sinful nature that resides in each of us – causes me to say and do things that I know I shouldn’t do. Sin has that effect on each of us. When I say and do those things, not only do I help advance the problem at hand, I lose sight of the real prize that has already been won in my behalf through Jesus Christ, my Lord and Savior. When I lose sight of the prize, I try to fight the storm on my own and I lose my way in the process. Thank God for His love, His mercy, and His Holy Word! Through His Word, I am reminded that, no matter what happens in government and no matter what the future holds for our country, I have eternal life through the death and resurrection of Jesus and nothing can take that away. Through Christ, I am equipped to respond appropriately when crisis rears its ugly head. Rather than stir the pot and contribute to the problem, I am equipped to rise above the fray and offer a voice of calm reason in the midst of the raging storm. The sinful nature that resides within me, and in all of us, will sometimes cause me to stumble. The Holy Spirit will convict me of those times, compel me to confess them, and help me to repent so I can get back to the work that God has called me to do. 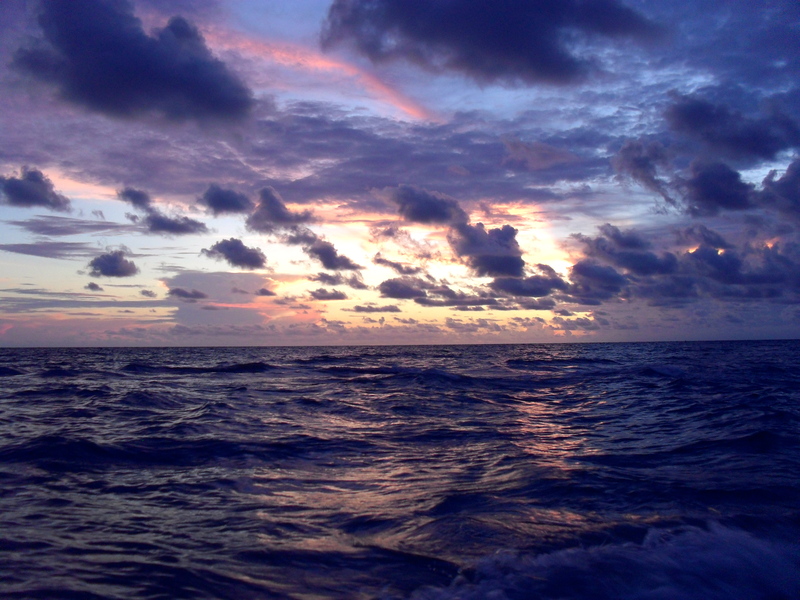 The love of God, manifested in Christ Jesus our Lord, is the calm in the midst of the storm. If you don’t know Him, contact me or reach out to a Christian friend – we’ll be glad to introduce you. If you do know Him and find yourself overwhelmed by the storms of this life, go into God’s Word and be reminded of your salvation; stop trying to fight the storm on your own! Then join me as I renew my commitment to being a positive influence, with my foundation in God’s Word, on my nation and all with whom I come into contact. My prayer for today: Heavenly Father, As I review some of my posts and communiqués over the past several days I realize that I have not honored You as I know I should. In doing so, I am part of the problem. Forgive me of this and all of my sins and guide me to true repentance. In so doing, help me to be an effective witness for You, that through my words and actions, others would see You. In Jesus’ name, AMEN.